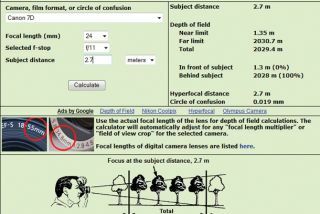 What is hyperfocal distance? Before the introduction of autofocus cameras, the use of 'hyperfocal distance' was a popular focus technique used by photographers - and it's still one of the really neat camera tricks for times when your camera struggles to autofocus in difficult lighting conditions. Hyperfocal distance is basically the distance that you can focus to at any given aperture, where the resulting depth of field will retain sharpness in the scene from as far away as infinity to the closest possible point. The depth of field increases greatly when combining smaller apertures with wider-angle zoom settings, so using the hyperfocal distance technique is particularly useful for landscape photography, especially when you're using a lens that has a built-in distance scale. Wide-angle lenses and narrower apertures both produce a greater depth of field. For example, using an 18-55mm zoom lens, you'll get a much greater depth of field at 18mm with an aperture of f/22 than you will at 55mm using an aperture of f/5.6. With a wide-angle zoom setting and narrow aperture, the hyperfocal distance will therefore be very much closer. In this case, it would be 77cm as opposed to 28.2m (see table). The 'crop factor 'of APS-C sensors is a further factor when calculating hyperfocal distance - the figures given here take this into account. When setting the hyperfocal distance for whatever focal length and aperture combination you're using, the depth of field will stretch from roughly half the hyperfocal distance to infinity. Let's assume you're shooting at a focal length of 24mm with an aperture of f/11. The hyperfocal distance works out to 2.7m, so everything from foreground objects just 1.35m away, right through to the distant horizon, should look acceptably sharp. Upmarket lenses usually have a focus distance scale either printed externally on the lens barrel or displayed beneath a viewing window. This makes life easy, as you can simply switch to manual focus (MF) and rotate the focus ring as necessary. However, many relatively inexpensive lenses don't feature a distance scale, so setting the hyperfocal distance is more of a challenge. A neat solution is to use a digital measuring device. Cheap ultrasonic models tend to lack accuracy and give poor performance outdoors, but laser measuring devices, like the Bosch PLR 25 Digital Laser Range Finder, work very well. This has a range of 5cm to 25m, with an accuracy of within 2mm, and costs about £65. It also includes a laser sighting pointer, for accurately targeting the object you want to use for distance measurement. Naturally, the hyperfocal distance can vary greatly if you change aperture or zoom setting, so shoot in Av mode to maintain consistent aperture setting and don't alter the focal length setting after positioning your camera. Once you've set the hyperfocal distance, you can shoot any number of different scenes using the same settings. If you're moving around a lot, it pays to apply a couple of strips of gaffa tape to lock the zoom ring and focus ring in place. Even so, review your photos in magnified view on your camera's LCD, to check sharpness throughout the scene on successive shots.